Here’s an idea I had for decorating a gift. 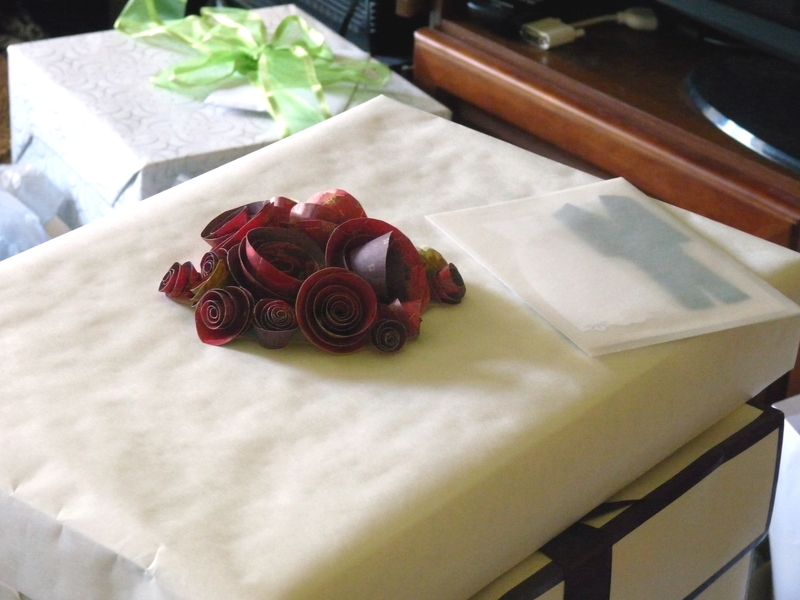 I recently read about a way to make paper flowers here, and thought they could make an interesting alternative to a bow on the top of a gift. So when it was time to wrap a gift for my brother-in-law’s wedding, I did just that. I used double-sided paper in colors similar to those in their wedding. The instructions I read suggested using a pencil or q-tip to wrap the paper around, but since I have a quilling tool, I thought that would be the easiest. These flowers are really easy to make, and can be as fancy as the paper you have to make them from. They can also be used for a variety of crafts. I’m already scheming another way to use them on a gift for the next wedding I’m attending! You should check out the instructions and try them out for yourself. They’re so simple, anyone can do them! This bouquet of flowers was very beautiful! I love your creative touches to our special events, Amber!